The process of manufacture was patented in 1935 by Rowntree's. In 1935, Rowntree's launched Aero Mint into the UK, followed by the milk chocolate variation in the 1970s. Wrapping was green (brown in the chocolate version) and displayed the "Rowntree's" script logo and the large word "AERO", along with the slogan "Hold on tight or I'll fly away!" below the "AERO" name. 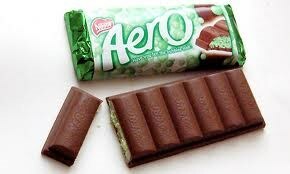 The words "Aerated Mint Chocolate" ("Aerated Milk Chocolate" for the chocolate version) were seen multiple times in the word "AERO." In the 1970s, an advertisement was aired in which kids flying a kite thought the kite was an Aero bar.